Learning how to make tealight candle holders can be fun for anyone who enjoys using candles as part of their home décor. 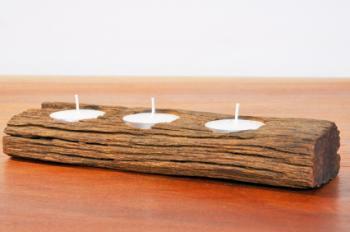 Handmade tealight candle holders also make wonderful gifts for family and friends. These projects are fun and easy to make. This easy candle holder design by Dana Hinders is a great choice for all ages. In fact, this simple craft is easy enough for a child to do with minimal adult supervision. Cut designs from colored tissue paper or patterned paper napkins. Seasonal color schemes are good when you want to make a candle holder for Valentine's Day, Halloween, Thanksgiving, or Christmas. General floral or geometric patterns are a good choice for year-round use. If you're planning to give the candle holder as a gift, try using the recipient's favorite colors. Adhere paper scraps to your candle holder using Mod Podge or white glue and your foam paint brush. Let it dry completely. 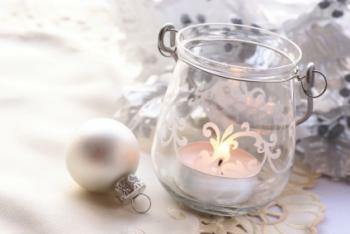 When your candle holder is dry, apply two thin coats of Mod Podge or white glue to seal and protect the candle holder. Let it dry completely between coats. Tie a ribbon around the neck of the jar to decorate it. Add beads or charms if desired. 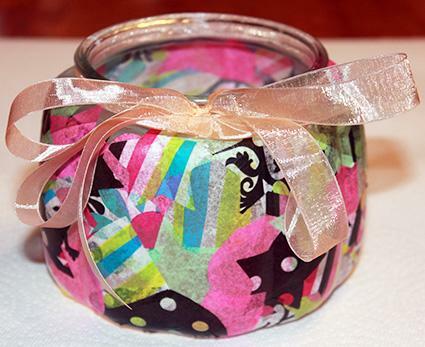 If this decoupage technique is too messy for your crafting tastes, you can also decorate jars with small stickers or scrapbooking rub-ons. There's nothing like the rustic look of reclaimed wood; however, tealight holders made of this beautiful material can be costly. Fortunately, you can make your own for a fraction of the cost. Since this project uses power tools, it's best for adults. Start by marking the locations for your candle cups on the piece of wood using the pencil. Each cup will be about one and a half inches in diameter, and it's up to you how many you use. Measure up half an inch from the end of the drill bit, and mark this spot with a piece of masking tape. This will tell you how deep to drill. Place your wood piece on a stable surface and drill holes in the spots you marked. Be sure you stop when you reach the tape. Insert the tealights into the holes you drilled. Although it can seem intimidating, glass etching is fun and easy. It also makes a great way to create a unique tealight holder. Because of the chemicals involved, it's best to make this candle holder in a well-ventilated area. This is a project for adults only. Apply your stencil to the glass holder, making sure to smooth out any air bubbles that are near the surface. Put on your protective gloves. Use the foam brush to apply the etching cream to the open area of the stencil. Leave the etching cream in place as directed on the product. Typically, this will be about ten minutes. Rinse off the etching cream in a sink. Remove the stencil. Your pattern will be etched on the tealight holder. You can also make a tealight holder out of a paper bag. Called luminaries, these candle holders make beautiful outside decor for special events, evening parties, holidays, and more. They're fun and easy for the whole family. Whether you're making a candle holder as a special gift for a friend or simply getting crafty with your home decor, these projects yield glowing results. For maximum impact, make several tealight holders and arrange them together in a display. You'll love the beautiful effect of your creative efforts.